SpaceX has made five successful rocket landings, two on land and three by sea, between Dec. 21, 2015 and July 18, 2016. In each of the landings, a SpaceX Falcon 9 rocket first stage booster returned to Earth. 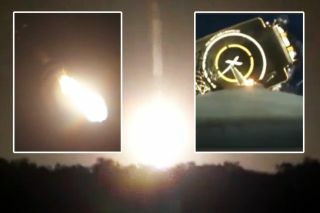 SpaceX nailed its fifth successful rocket landing in a brilliant overnight flight today (July 18), and to celebrate we've combined all five of the private spaceflight company's booster landings into this single awesome video. The rocket landings by SpaceX are part of the company's quest to perfect a reusable launch system that could drastically lower the cost of spaceflight by reusing boosters instead of just throwing them away. During today's launch, SpaceX launched a Falcon 9 rocket from Florida's Cape Canaveral Air Force Station, sending a Dragon capsule filled with NASA cargo toward the International Space Station. The rocket's first-stage booster then returned to Earth, making a pinpoint touchdown on a SpaceX landing pad near its original launch site. You can see more photos of the awesome rocket launch and landing here. SpaceX's first rocket landing during an orbital flight occurred on Dec. 21, 2015. Building on that success, SpaceX tried (and failed) to land a rocket on one of its ocean pads twice in early 2016, ultimately succeeding on April 8, when a Falcon 9 booster touched down on the drone ship Of Course I Still Love You after launching a Dragon cargo ship for NASA. SpaceX has two landing platforms for drone ships (the other is Just Read The Instructions) that are named after the fictional sentient starships envisioned by science fiction author Iain M. Banks. On Saturday (July 16), SpaceX representatives said that they were aiming to re-fly a Falcon 9 booster sometime this fall. Early today, they added that the first launch to reuse a Dragon capsule (another reusability goal) could occur in 2017. Editor's note: This story was corrected on July 19 to reflect that SpaceX has landed its Falcon 9 rockets to date on the drone ship Of Course I Still Love You.